Nhlanhla is one of the Zulu language's most wonderful words. It really means "good luck", but it also conjures good fortune, happiness, largesse and all the warm feelings we get when life is kind to us. Dubbed Nhlanhla by the Zulus who brighten our lives every day at Hartford, the name recalls the feelings of our team when they first saw Nhlanhla in its finished form. The suite radiates nature, the colours of our environment, warmth and originality, and as much as anything is a signal example of what the creative spirit can achieve from modest, locally sourced materials. The majority of the materials used in the erection of Nhlanhla were harvested off the greater Summerhill and Hartford estates, and where this was not possible, from our immediate environs. This suite was the most recent of four comprising the Ezulweni ("in the heavens") eco extension to Hartford House's colonial origins. 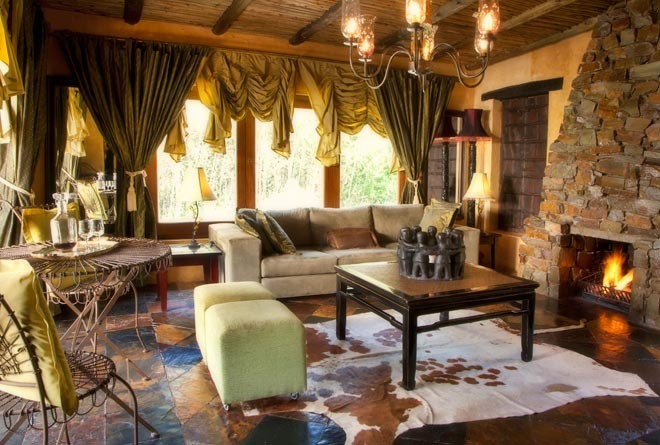 The intention in juxtaposing the original Hartford homestead with Ezulweni, is to provide travellers with an insight, when they are in the manor house, of our region's colonial past, and then to transport them through an intimate glimpse of what's possible with a touch of imagination from our Zulu staff, whose creative hands are strikingly apparent in the finishes to Nhlanhla. 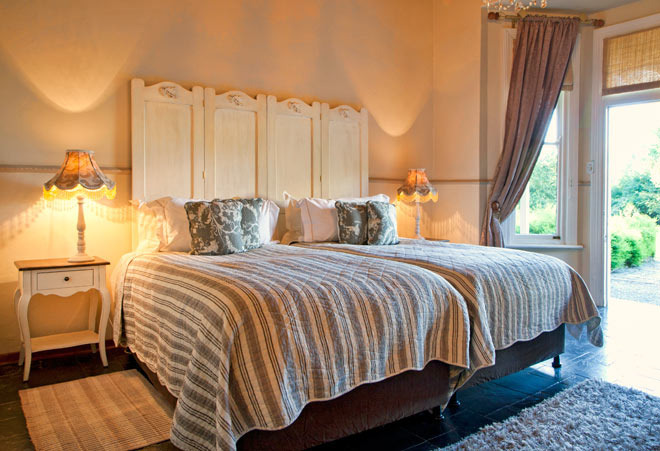 In contrast to the rustic materials used in the development of the suite, the fine mahogany wardrobe housing the television and mini-bar, was imported to South Africa in the 1820's and was acquired from a village in the Eastern Free State. The teak floors were rescued from the renovation of Durban's "grand old dame", the Edward Hotel, while the Indian front door was imported by Cheryl Goss when she was overseeing the renovation of what is now Lynton Hall. Internationally acclaimed for her work at Lynton Hall, Cheryl's introduction of Indian antique furniture to that property recalls its association with the arrival of Indian indentured labour in Colonial Natal. 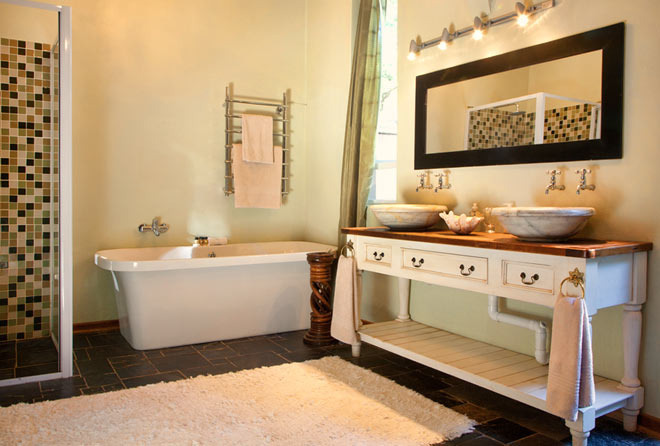 The copper bath is a creation of a customer of the racehorse stud, Summerhill, while the beds are from an altogether different age, featuring a hydraulically adjusted touch button (just below the mattress on either side), enabling guests to position themselves as their souls demand, after another "tough" day in Africa! Nhlanhla has become the suite of choice of His Majesty King Letsie III of Lesotho, ruling monarch of the Mountain Kingdom, during his visits to Summerhill Stud, where he keeps several horses which feed his and his nation's passion for the equine species. 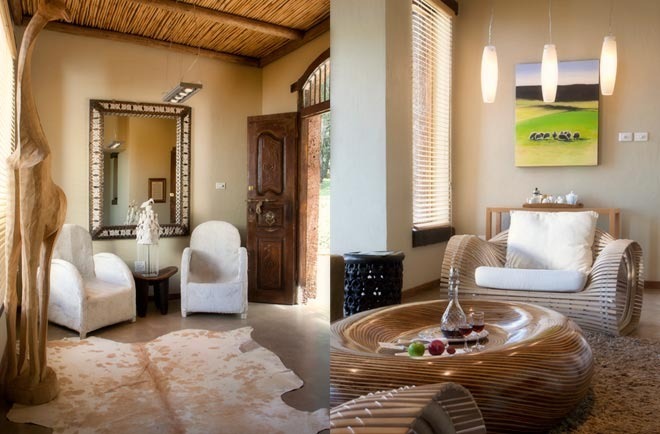 In Zulu the word Siyabonga means "we are grateful" or "give thanks to", and this suite is part of the Ezulweni (meaning "in the heavens") eco extension to Hartford's own colonial styled origins. 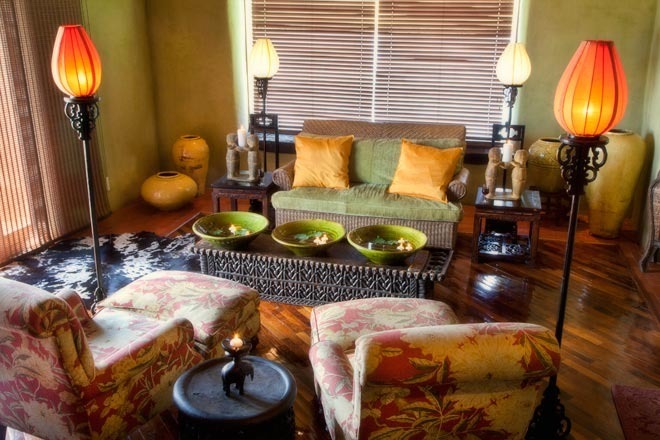 The suite was named that way by our Zulu building team once complete, as much echoing their own relief at having accomplished what was for them in the nature of something unique in architectural style, as it was for the natural beauty and ambience which the suite exudes. 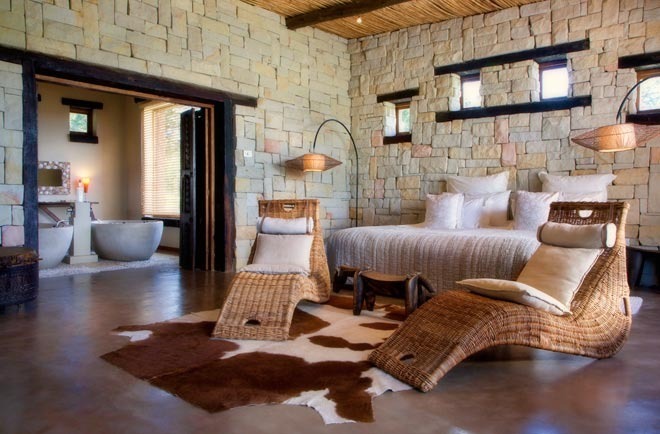 Built with materials harvested largely off the greater Summerhill and Hartford estates, or otherwise acquired in the near vicinity, Siyabonga is characterized by its collection of African artifacts and its stunning sleeping quarters, clad in local Drakensberg sandstone. The bathroom features romantically aligned twin tubs, and the suite is rendered with a combination of mud and locally harvested river pebbles, all of which has withstood the ravages of our summer thunderstorms and occasional winter snowfalls with surprising resilience. The Indian front door was imported by Cheryl Goss while she was overseeing the renovation of Lynton Hall, which she decorated in Colonial antiques, recalling the arrival of Indian indentured labour for the colony's fledging sugar industry. In recent times, Siyabonga has become the suite of choice of His Royal Highness Sheikh Mohammed of the Ruling Family of Dubai, during his visits to Summerhill Stud, where he stands several stallions and mares of world renown. Another visitor of fame whose name has become embedded in the lore of Siyabonga, is Angus Gold, a celebrated reveller, who is also associated with the Deputy Ruler of Dubai, Sheikh Hamdan al Maktoum. 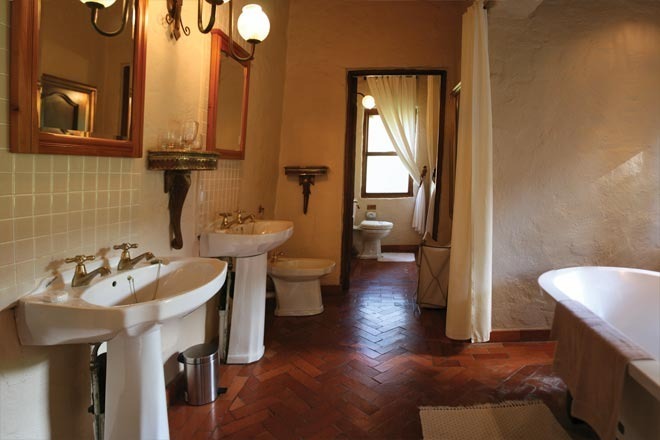 The intention in juxtaposing the original Hartford homestead with Ezulweni, is to provide travellers with an insight, when they are in the manor house, of our region's colonial past, and then to transport them through an intimate glimpse of what's possible with a touch of imagination from our Zulu staff, whose creative hands are strikingly apparent in the finishes to Siyabonga. 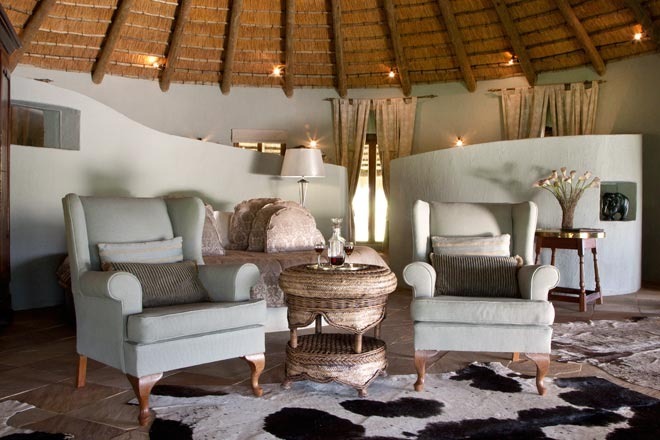 In contrast to the natural materials with which the suite was erected, the beds are from an altogether different age, featuring a hydraulically adjusted touch button (just below the mattress on either side), enabling guests to position themselves as their souls demand, after another "tough" day in Africa! The word Inkanyezi means the first or the evening star in Zulu, and this suite was christened in that calling by the Zulus who built it. Most of our Zulu staff come from rural environs, and almost all of them have grown up in rondavels built of mud. Yet those that were engaged in building Inkanyezi marvelled that people of European descent should be building with materials of mud, timber and thatch, while most of our African brethren these days have embraced the materials used by Europeans. The main entrance door is from India, and was chosen by Cheryl Goss while she was busy remodelling what is now Lynton Hall, where the antique furnishings echoed that property’s colonial past and its association with indentured Indian labour. The verandah columns are of Rhajastani origin. 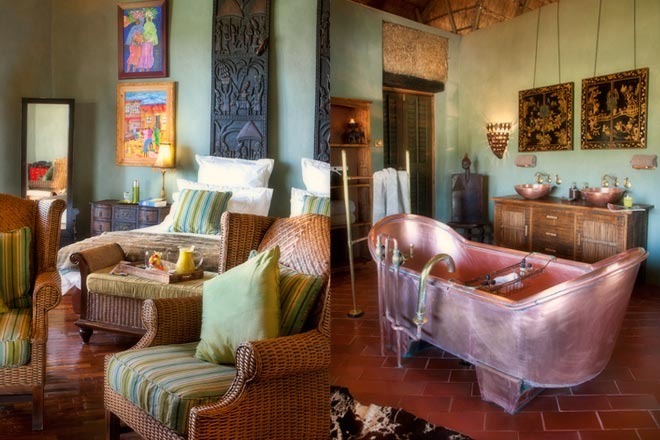 One of the "eco" suites making up Hartford's Ezulweni ("in the heavens") collection, Mbulelo was fashioned almost entirely from locally sourced materials. The mud bricks were harvested from the clay foundations on the site on which the suite stands today, mixed with horse dung and shredded horse bedding, and then sun-baked (as opposed to "kiln" baked) for the purpose. Almost all the timber, as well as the stone and slate, has come from the estate itself or its immediate environs, while the doors and shutters were imported by Cheryl Goss from India while she was busy remodelling what is now Lynton Hall, where the furnishings echo that property's colonial past, and its association with indentured Indian labour. These pieces were "leftovers" from that project, and there are other recollections of them to be seen in the columns around the neighbouring rondavel suite, Inkanyezi and the other with the "garden" roof, Siyabonga. Mbulelo means "thank you" in Xhosa, the language Mick Goss grew up with. It's as much a gesture of thanks for the fact that this building, with its local materials, built by our Zulu staff and possessed of a flat roof with all the potential for "leakage", hasn’t disintegrated after several years in existence, as it is for the gratitude we owe for the environment in which we live, and the remarkable people among whom we live. 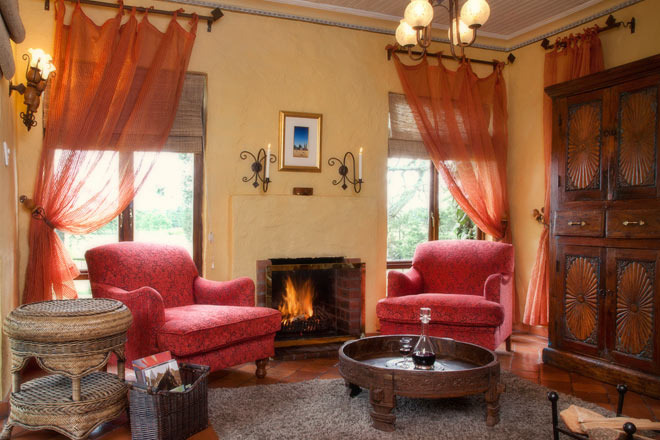 The intention in juxtaposing the original Hartford homestead with Ezulweni, is to provide travellers with an insight, when they are in the manor house, of our region's colonial past, and then to transport them through an intimate glimpse of what’s possible with a touch of imagination from our Zulu staff, whose creative hands are strikingly apparent in the finishes to Mbulelo. We are blessed on our farms with an abundance of water, with numerous underground springs spread across the length and breadth of the property. The word Emtonjeni means "at the springs" in Zulu, and this suite takes its name from its proximity to the swimming pool, and the springs. "The Springs" was also the name of the farm in East Griqualand on which Pat Goss snr founded his renowned racehorse breeding enterprise in the 1930's. This suite fronts onto an old bathing pavilion (now the Wellness Centre), which dates back to the foundation of the Manor House, in 1875. The Moors, who were the first occupants of Hartford as we know it, initiated a habit of giving to each other, a plant or a piece of garden statuary or ornamentation on wedding anniversaries, and the bathing pavillion was one of the first of these. Since then, the Ellises and the Gosses have perpetuated this rather quaint habit, and most of what you see in the garden today came about as a result. We are blessed on our farms with an abundance of water, with numerous underground springs spread across the length and breadth of the property. 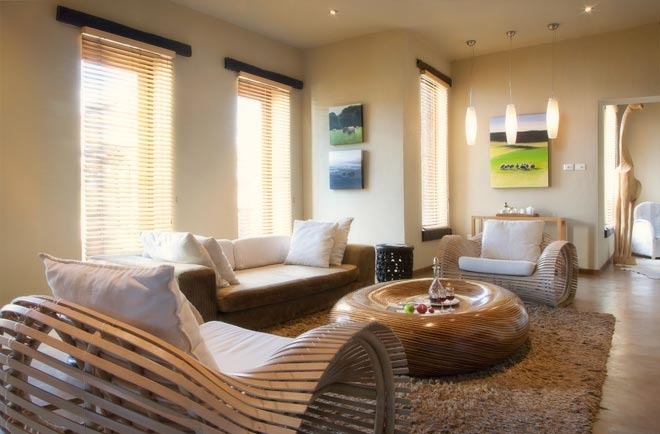 The word Emanzini means "at the waterside" in Zulu, and this suite takes its name from its proximity to the swimming pool, the Wellness Centre and the springs. "The Springs" was also the name of the farm in East Griqualand on which Pat Goss Snr founded his renowned racehorse breeding enterprise in the 1930's. This suite fronts onto the old wisteria pergola, which dates back to the foundation of the Manor House, in 1875. The Moors, who were the first occupants of Hartford as we know it, initiated a habit of giving to each other a plant or a piece of garden statuary or ornamentation on wedding anniversaries, and the pergola was one of the first of these. Since then, the Ellises and the Gosses have perpetuated this rather quaint habit, and most of what you see in the garden today came about as a result. Originally known as the Garden suite, Heliotrope and its neighbour were the first attempt by our previously unskilled Zulus at building with bricks and mortar. A fine effort, we're sure you'll concede. 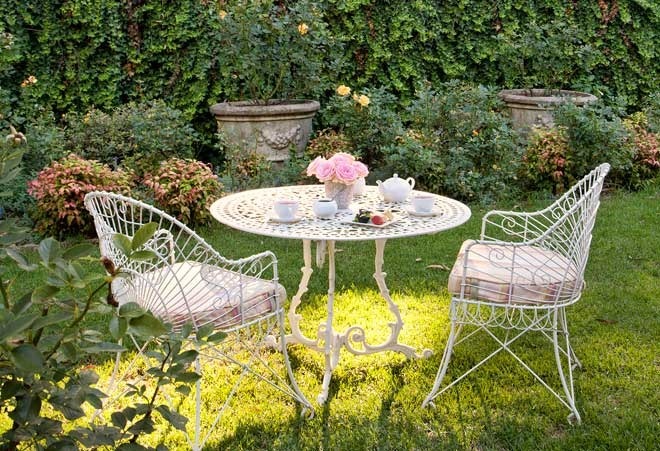 Appropriately, the suite takes its name from the Heliotrope flower, and a parallel connection with the first racehorse owned by Mick Goss and his family. Originally selected by Mick's late father, Bryan, shortly before his premature death in 1977, a one third share in the R900 purchase Heliotrope was the sum of Mick's inheritance, though he did get the racing "disease" from his Dad and grandfather, Pat snr. Yet it was this modest horse that ignited the fire which burns so brightly in the subsequent history of Summerhill Stud, the multiple champion racehorse breeding establishment on the continent, and of course, in the distinguished story of Hartford, which was the subject of an exchange for the Goss family property in Hillcrest, just outside Durban, in 1990. A humble but game little racehorse, Heliotrope provided Mick and Cheryl with one of their most thrilling moments when he became a winner on only his second racecourse start, and this early success led to the Gosses acquiring their first race filly, Pagoda, the foundation mare in the Summerhill story. The furnishings in these suites are drawn from such diverse places as India and Morocco, while the teak flooring was part of the original dining room in the fabled Edward Hotel on Durban's Golden Mile. Originally known as the Garden suite, Alyssum and its neighbour were the first attempt by our previously unskilled Zulus at building with bricks and mortar. A fine effort, we're sure you'll concede. Now named Alyssum, for the flower of course, the name also remembers one of the greatest of all Hartford racehorses. Alyssum (the horse,) excelled against the best of his generation at distances ranging from five furlongs (the human equivalent of a 100 metres sprint at the Olympics) to ten furlongs (the equivalent of the mile to humans), which exemplified not only his versatility, but also his abiding class. Alyssum was one of the mainstays of the famous Ellis string of the 1950's, when the Hartford colours swept all before them on the racetracks of South Africa. Indeed, in owner-breeder terms, the Ellises have no parallels in South African racing history, and it was the great thoroughbred author, Sir Mordaunt Milner, who described their achievements in the same breath as those of Lord Derby, the Aga Khan and the Sheikhs Maktoum in the United Kingdom, the great European breeders, Boussac and Tesio, and the famous American stables of Phipps and the Hancocks. There was a time when their supremacy was such that if there was a horse in the green and black silks on its way to the post, it was as good as money in the bank! This suite was part of the original stables built by Italian prisoners of war in 1941, some two years after the Ellis family had acquired Hartford. It is named for one of the greatest and most courageous horses ever to look through a bridle, Mowgli, who was voted in the year 2000 as the best racehorse in South African history, ahead of the legendary likes of Sea Cottage, Colorado King, Hawaii and Horse Chestnut. Mowgli achieved his fame as a racehorse by winning six Group One races in the space of twelve weeks, a feat never again achieved by a racehorse anywhere in the world. However, his badge of courage came courtesy of the fact that he suffered from a chronic breathing problem. As he lowered his head and neck for the final run for home, his epiglottis would shut down on him, limiting him to just a breath or two as he struggled titanically up the straightways of South Africa's most famous courses, several times causing him to collapse as he passed the post. There's no doubt he knew where the wining post was, and he knew when he'd reached it, with the rest of the field at bay. Sadly, this great warrior was unable to extend his genetic influence on account of a fatal paddock accident, which cost him his life shortly after he returned to stud. Named for St Paul's Cathedral in London shortly after the Battle of Britain, the diminutive equine version, St Pauls, remains the smallest winner of Africa's most famous horserace, the Durban July Handicap. He was the property of Pat Goss snr, grandfather of Mick Goss, whose family is the current custodian of Hartford House and its rich legacy. St Pauls remains etched in the memory of many South African racing fans, winning the 50th edition of this grand event in 1946 from the outside draw in record time, and his exploits lent impetus to the development by Pat Goss of his well known private breeding establishment at The Springs in East Griqualand. St Pauls was the first of several Durban July Handicap winners produced by the Goss and Ellis families (the latter the founder of a storied racing and breeding enterprise of the 40's, 50's and 60's), their involvement with Thoroughbreds dating back to the 1930's.